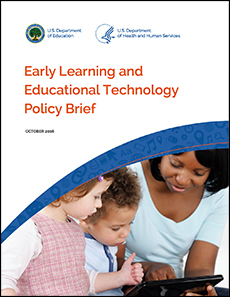 Recognizing the growth of technology use in early learning settings, the U.S. Department of Education and U.S. Department of Health and Human Services collaborated in the development of the Early Learning and Educational Technology Policy Brief to promote developmentally appropriate use of technology in homes and early learning settings. The guidance will help those who care for nearly 36 million children from birth to age eight make wise decisions about media use, and provides four guiding principles for families and early educators on the use of technology with young children. The brief includes a call to action for researchers and media and app developers, highlighting topics for further research and encouraging the development of research-based products.